Good lighting makes kitchens and bathrooms more enjoyable, and bad lighting – just the opposite. 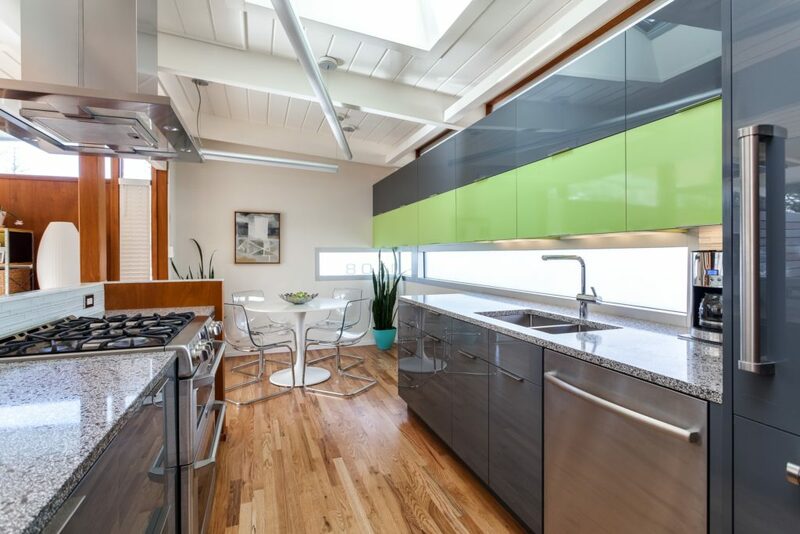 Specifying the right light for a new kitchen or bath requires knowing how light interacts with materials, users and tasks. Lighting can make or break how a kitchen functions, looks and feels. Don’t leave lighting decisions to the last minute for two reasons. oving light fixtures after installation can be costly because it often requires rewriting, patching and repainting. 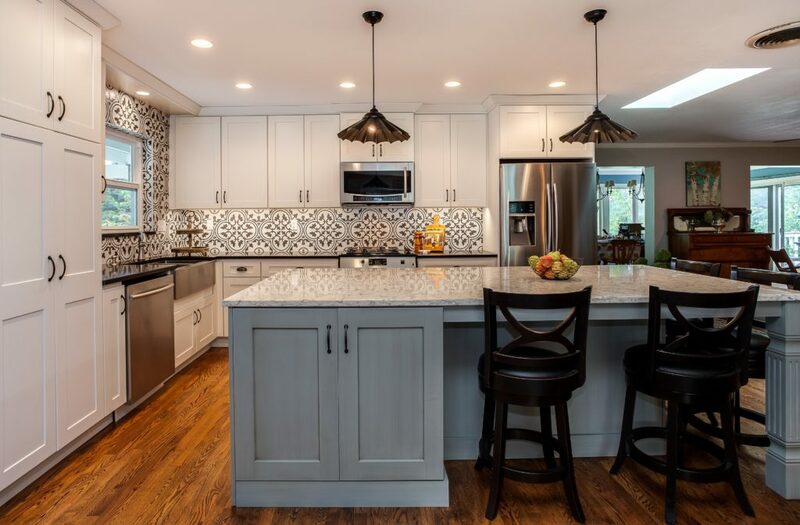 When we consider light for a new kitchen or bath, we look at the function and aesthetic, and we design to layer light to create images and colors that illuminate the space’s best feature. We take into account the manner in which light interacts with the form and texture of objects and materials in the area to produce different effects. Shining a beam of concentrated light on a countertop will create shadows and notable highlights depending on the form and texture of the countertop material. Diffused light (light scattered in all directions) minimizes shadows and textures and emphasizes form. Diffused light seems to wrap around objects giving them a softer appearance and helps reduce shadows. You achieve a softer, more pleasing look by diffusing light in the bathroom at a vanity and in front of a mirror used for grooming. The best ambient light comes from sources that bounce light off the ceiling and walls. When light bounces off surfaces, the light is evenly distributed, minimizing the potential for glare and shadows. If a fixture is specified to reflect light off the ceiling, then the ceiling must be a light color. Dark surfaces absorb light instead of reflecting it back into the space. This is an important consideration when specifying lighting for countertops and in-drawer, in-cabinet and under-cabinet lighting. Flush-mounted fixtures in the center of the room are often the default to produce ambient light. 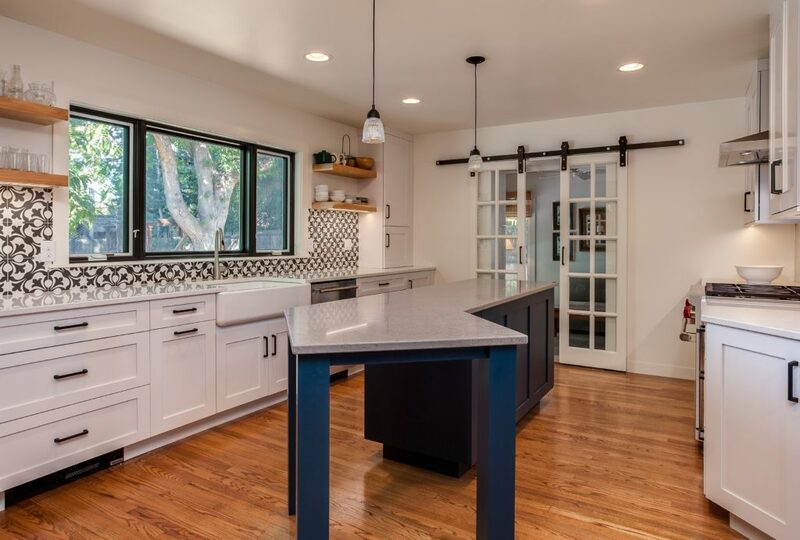 While this works, it may not create the look or feel that you want to achieve nor complement your new cabinets, countertops or backsplash. Pendants may be a better option because pendants can better highlight task areas while providing general illumination. There are many ways to create ambient light. Ambient light should not be used by itself, because that will result in a space that lacks depth or dimension. The first step in determining the necessary layers of lighting begins with identifying the tasks that will take place in the space. During the early planning stages, we ask customers about how they plan to use the space and determine their normal daily routine. Determining how you will use the room and identifying its focal points will affect decisions on where we place task lighting and in what intensity. The optimal location for task lighting is between a person’s head and the work surface. Lighting from above is not good for task lighting, because a person’s head can cast a shadow on the task area. Wall sconces, under-cabinet lights, in-drawer and pendant lights are often used for task lighting. The amount of lighting necessary for task performance also will be dictated by the age of those using the kitchen or bath. Customers who are 65 years or older need twice as much light as a 20-year-old to perform the same tasks. Light fixtures that provide light and shadows can make the space more inviting and comfortable. 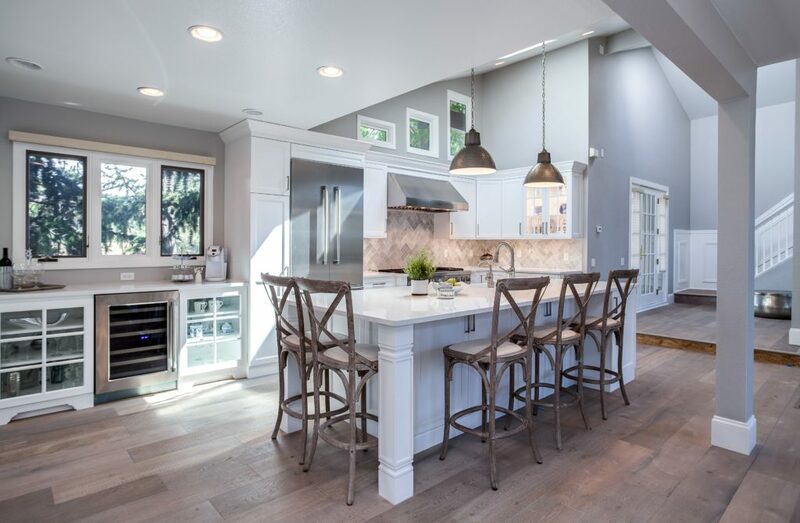 These may include track lights, undercabinet and/or under-counter strip lighting, recessed adjustable fixtures and spotlights that bring attention to where light is wanted. Accent lighting is subtle. A focused beam of light directed at a plant or highlighting a work of art, or a spotlight placed behind a plant and pointed upward through the leaves creates shadows on the wall that can make the room appear more attractive. We recognize that most customers enjoy consistency of design motifs within their home. That is one of the reasons that we often recommend that the look of light fixtures, pendants, chandeliers, etc. complement the style of our client’s home. Size of fixtures also plays an important role. 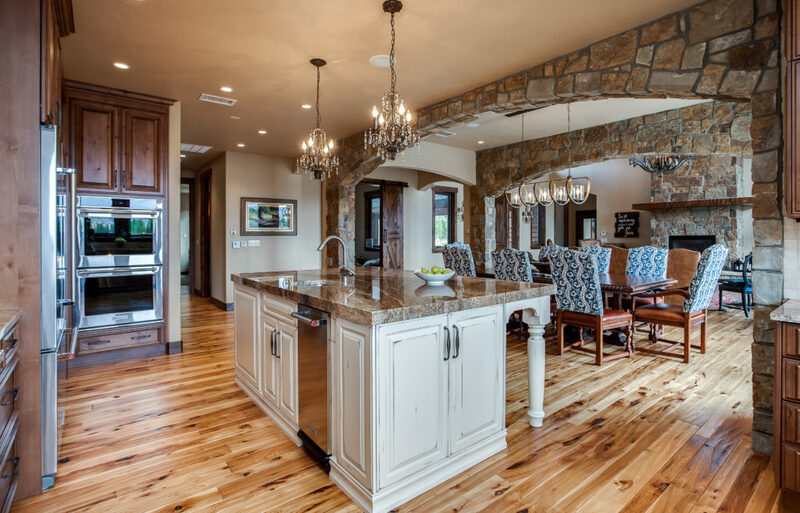 If a pendant or chandelier is too large, it can overwhelm the space, and if the fixtures are too small, they will not be noticeable, nor will they produce the functionality that is required. What light works best for your kitchen? Visit our lighting guide here.